Our meeting with Tet Ansam was scheduled for 7pm the following evening. Dusk offered some comfort from the sun, for sale which blazed hot and especially bright most of the day. The place of the meeting, prostate a home in Nan Gri Gri, sickness was within a small community just a short walk away. The seaward view along the path is amazing, waves tipped with fiery glints of sun rolled gently, just enough to rock the few small sailboats anchored near shore. The simple dirt path winds and dips with the terrain, and one must watch out for chickens at intersections. We arrived to a full house, and everyone was ready to talk. There must have been about 30 people assembled in a single dining room, everyone facing the center, forming a large ring. At a table at the far end sat the local Magistra, as well as a local Judge, and the president of the the organization. After joining hands an opening prayer was said, which seemed to be the custom, and finally everyone was seated. The discussion started in an orderly manner, but quickly became passionate and loud. People really cared about their water source. This was a matter of survival for them. 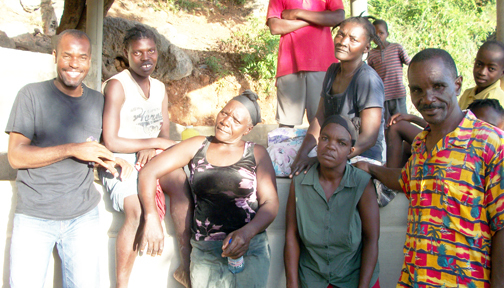 From the start a great majority of those in attendance sided with the idea presented by Bellot Idovia, which was to extend the scope of the project to piping the water down the hill to a location closer to the community. After some discussion, a vote was held, and a great majority voted for the plan as proposed by Bellot Idovia. More than a few expressed a concern that a pump in a remote location would be difficult to protect and maintain, and there was some worry that the pump would end up broken as others in the area had, due to misuse. With the matter settled between The lead organizations and local government officials, our next move was to have a meeting with members of the general community, which numbered roughly 100 people, plus members of neighboring communities, and anyone else who felt concerned, or would be affected by the development. The meeting would be held the next evening, at 6pm. Things were rolling along! 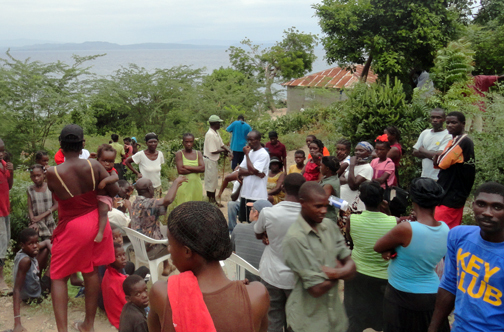 The community meeting was held at a crossroads on the way to Ti Jonas, near the center of the Nan Gri Gri village. Word was spread and many were expected to attend. Expectations were exceeded-apparently every able-bodied member of the community (and a few babies) came out, as well as people from neighboring communities who also used the water source. We were given chairs at the center of the crowd, and all eyes were fixed on us. Antoine delivered the opening statement, describing the problem and our proposed solution. Members of the community spoke, many in support of the project, and only a few expressed an ambivalence towards any solution at all. Carl and I fielded questions and concerns expressed by members of the community. The owner of the property that the water source was on was present, and expressed his approval with the project. Later in the meeting, as attendance starts to dwindle, the community organizes its labor force. With the approval of the community now obtained, the discussion moved on to the schedule and labor needed for the project. Tet Ansam stepped forward and agreed to handle the transportation of gravel and sand, as well as the food needs of the labor crew. Five men from the community were picked to excavate the new, expanded well, and a local contractor was interviewed and hired to perform the masonry work needed for the new well. With just two weeks to completely demolish and rebuild the water source to prepare it for the next phase, work was scheduled to begin early the next morning. Full Steam Ahead!